Nepali hal: Binod Chaudhary in Forbes. 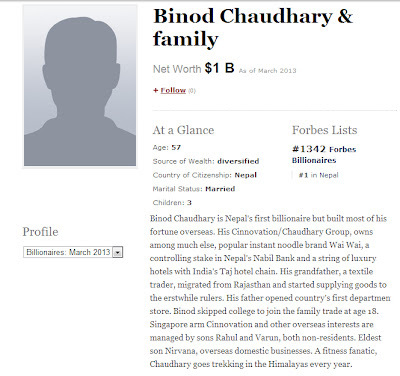 Binod Chaudhary has been the first Nepalese to be listed in the Forbes list of Billionaire. Below is the screenshot from the Forbes website. To see in the original Forbe's site click here. Mr Chaudhary's tweet after that. To stay updated with our blog please like us on Facebook. We'll never bore you. Plight of Nepalese students abroad. A detail account of Ex-Prince Paras Shah's heart-attack. 15 inspiring donations made to Help Nepal Network by Nepalese residing in Nepal recently. Top 10 cities of Nepal. US study, Q/A with consular.